Disney Infinity has become an annual franchise. Last year, fans were treated to a Marvel experience and this year, Disney flexes their IP muscles with Star Wars. While I feared reviewing Disney Infinity 3.0 after last year, I was pleasantly surprised to find out that not only is 3.0 better than 2.0, but also has no signs of suffering from annual release fatigue. I’ll start by saying that I’m not a huge Star Wars fan. I don’t dislike it, I just didn’t find myself following The Clone Wars or anything beyond Episode 4, 5 and 6. 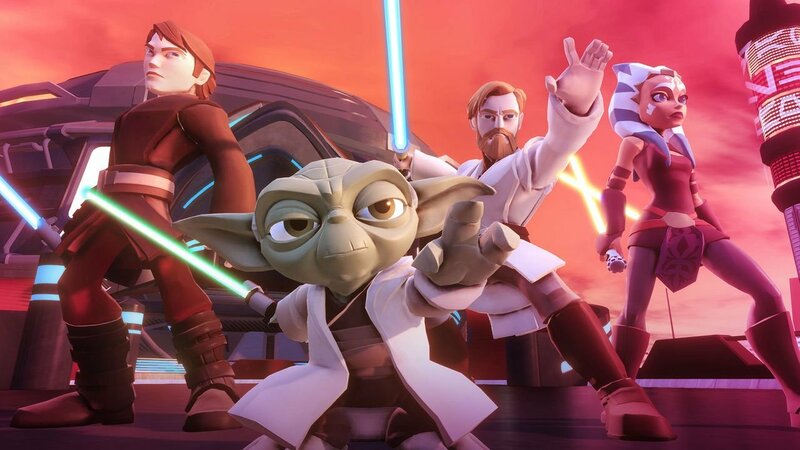 I saw Episode 1 and very much regretted it; however, I can honestly say that playing Disney Infinity:Twilight of the Republic has actually intrigued me enough to dive deeper into The Clone Wars story. And yes, Jar Jar does show up in the game, and no Jar Jar, I don’t really want to help you do anything. Disney Infinity 3.0 has one of the best “tutorials” I’ve ever experienced. It drops you right into the action of Star Wars and instantly, you’re wielding your lightsaber, enjoying the satisfaction of tearing into some droids. From there, it allows you to play as Joy from Inside Out, allowing the player to get a feel for more of the platforming that DI can offer in expansion packs. And even before you make it into the Toy Box Hub, you have a chance to drive around as Mickey Mouse, demonstrating to the player the new karting expansion pack. Now, I’m pretty sure Mickey cheated in this mini tutorial by taking a shortcut; that’s not very M-O-U-S-E of him. Even though I’m not up to date on all things Star Wars, I really enjoyed playing through the campaign. Right off, I chose to mainly play using Ahsoka Tano (she dual-wields!) rather than Anakin Skywalker (a name I’m familiar with). Both figures come with the Twilight of the Republic pack. The combat feels much tighter than DI2.0.. Not only is the lightsaber combat more rewarding with slow action “death” scenes, but it is far more initiative and fluid than past DIs. My only upset was that the camera still has some issues. I always seemed to be focused on enemies off-screen and the camera would not automatically rotate to accommodate my fighting or the camera would be behind an obstacle and I wouldn’t be able to see my foes. Players also have the ability to use The Force. Nothing makes you feel more powerful than standing down a hallway and force pushing a crowd of droids. Hee-yah! I can see how one would become intoxicated by the Dark Side. The feeling of power did not translate, however, to flying. I felt the flying was rather clunky and unintuitive. I was bashing into everything, but DI is rather forgiving when it comes to the ship’s health. 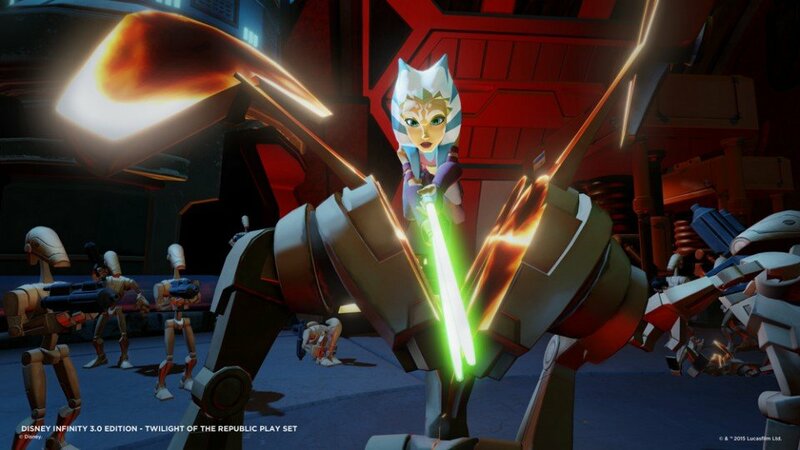 Of course, with Disney Infinity, there is the opportunity to use the Toy Box and build anything your heart desires. I personally am not the greatest architect but, luckily for me, there is always other user-generated content to play around with. All user-generated content is approved by Disney first to help keep the game and community child-friendly. And if you don’t want to go online, players can participate in a variety of Toy Box Hub challenges. Players can explore The Toy Box Hub which allows them to access all kinds of extras besides the campaign. Players can train, explore, and even hang out with the Marvel characters. You can find endless amounts of fun here; you can even race! All these challenges will reward players with experience orbs or blue orbs (currency). If you’re lonely, you can even unlock a sidekick to follow you around. Your sidekick can be outfitted with armor and weapons so they can fight by your side. Ahsoka hung out with Robin Hood when in the Hub—I hope Maid Marian wasn’t too jealous. Sometimes this is all very overwhelming, it really is a lot to take in and explore, especially if you have a DI account; then you can play with others online in the arcade. My absolute favourite thing to do was mash together Star Wars and Halloween Town. I had Ahsoka lightsaber dancing all over the town square to This is Halloween. The multiplayer experience is similar to past Disney Infinity games; local couch co-op on a split screen. This is great for parents wanting to play with their kids or even siblings who don’t share well. Online can be accessed with a Disney account, allowing players to discover even more content to enjoy. Disney Infinity 3.0 definitely managed to improve on last year’s model. With the fluid combat, even more Toy Box Hub options, and gameplay to cater to every play style, there are endless hours of fun here and I could write pages and pages for this review, but no one wants to read a novel. So instead, pick it up and play it to appreciate it for yourself. However, Disney Infinity 3.0 will definitely be a giant money sink, with so many expansions and figures to buy, but you kind of expect that from toys-to-life titles. I’ve already picked up the Inside Out pack! The multiplayer experience is similar to past Disney Infinity games; local couch co-op on a split screen. This is great for parents wanting to play with their kids or even siblings who don't share well.